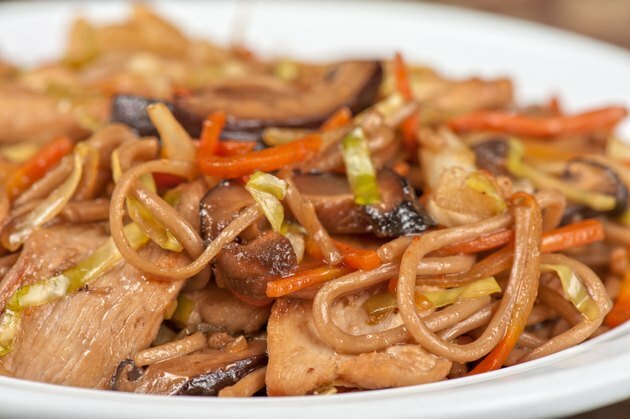 Yakisoba noodles are the starch component of a number of Asian dishes. These noodles can be incorporated into stir fry, paired with vegetables and even eaten on their own. The noodles themselves look similar to Ramen noodles and are made from wheat flour and egg. They are yellower than other types of noodles and are sold fresh or dried. Although recipes abound that include yakisoba, the process of cooking the noodles themselves is fairly simple. Place the yakisoba noodles in the water to cook. If the noodles are dry, cook according to the package directions, usually five to seven minutes. Fresh noodles only need to be heated, so one or two minutes in the boiling water is sufficient. Pour the yakisoba noodles into a colander, and let the water drain from them. Transfer the yakisoba to a wok or other pot to be mixed into a stir fry or other recipe. Serve immediately. If you are preparing a cold dish, place the noodles in the refrigerator for a couple of hours. If you are eating the yakisoba on its own or if your recipe calls for adding sauce or a dressing to the noodles before pairing it with other foods, drizzle the sauce or dressing over the noodles and toss with tongs in a large bowl so the sauce evenly disperses. Are Cellophane Noodles Low in Calories?